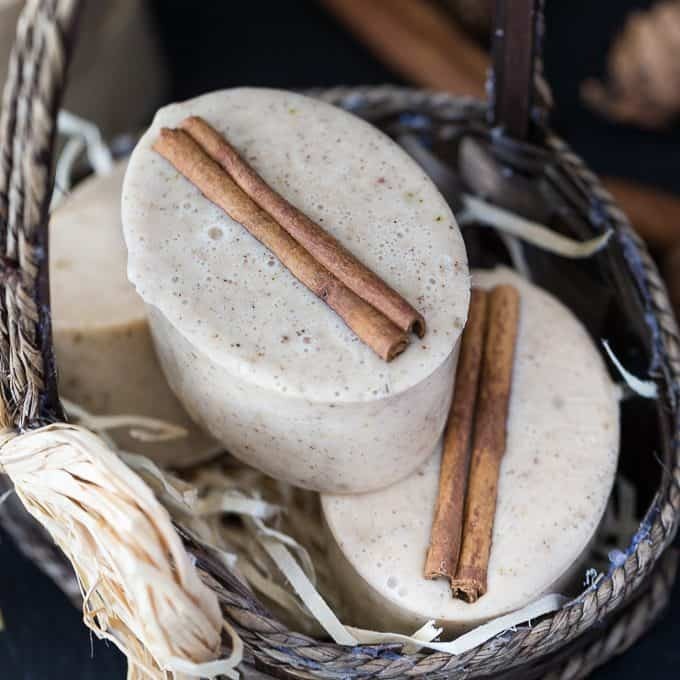 Out of all the DIY soaps I’ve made, this Apple Cinnamon Goat’s Milk Soap may be my favourite one! 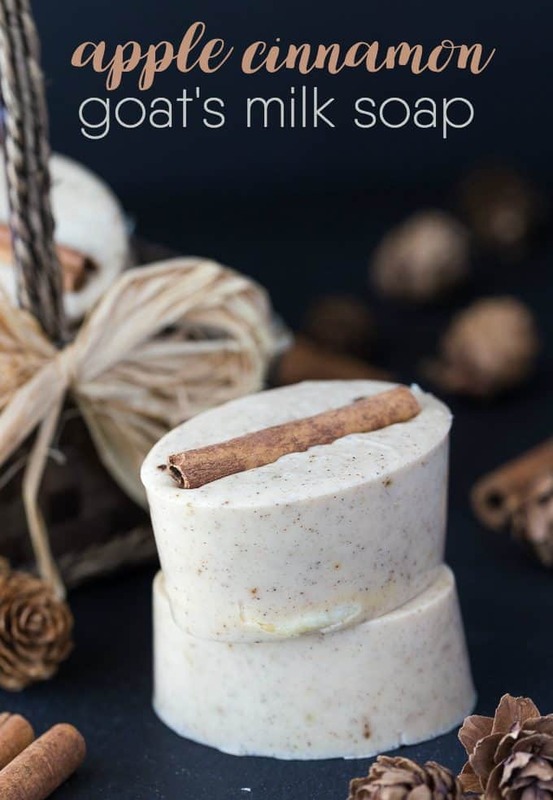 I used a goat’s milk melt and pour soap base. It’s one I’ve worked with a lot and I love how luxurious it feels on my skin. For scent, I added my Apple Pie Spice and some clove essential oil. It smells like fall! I even included some dried apple slices and a cinnamon stick to give it a rustic feel. 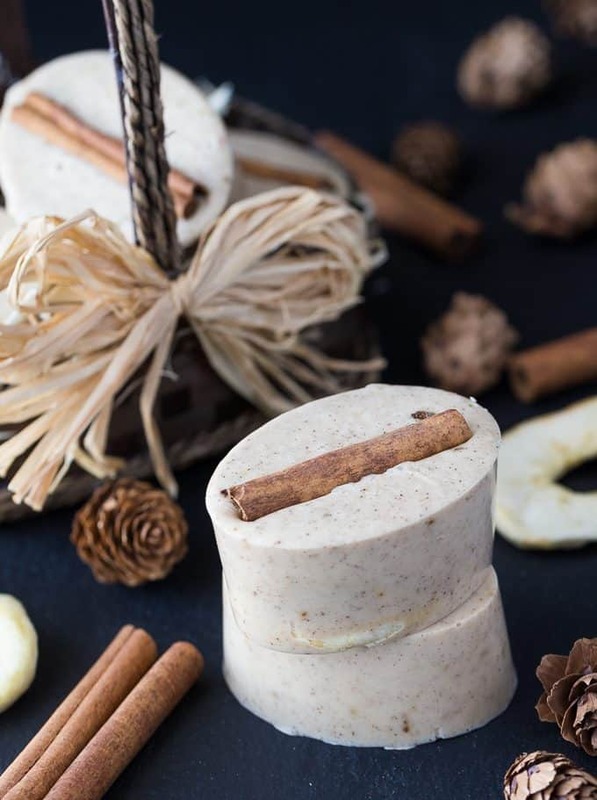 It’s a beautiful soap in both scent and presentation and makes a lovely DIY gift for someone special in your life. Place one apple slice at the bottom of four silicone soap molds. Add soap cubes to a microwaveable bowl. Microwave on high for 30 seconds. Then microwave at 10 second intervals, stirring in between, until soap is melted. Quickly stir in clove essential oil and apple pie spice. Pour into a silicone soap mold. Top with a cinnamon stick. Let sit at room temperature for at least 40 minutes. To remove, turn over soap mold and carefully push on the bottom to pop out the soaps. I hope you’ve been enjoying all my DIY beauty posts. I know I love creating unique products and sharing them with all of you. My family and friends aren’t complaining either. They’ve been enjoying the fruits of my labour. Do you love the smell of apples and cinnamon? 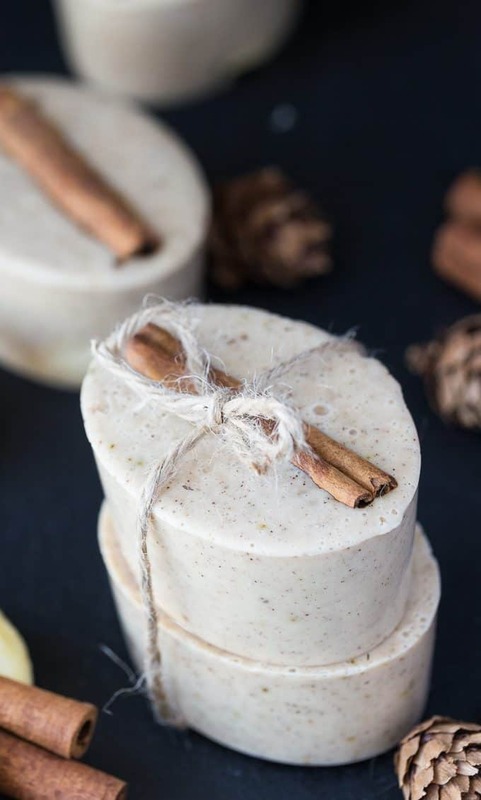 This soap is so pretty and a good one to make and give during the Holidays! I really like how fun it is to make my own soaps. Thanks for the recipe! So lovely! I keep meaning to make soap – I even browsed Amazon for soap bases the other week! I really need to actually do it sooner rather than later because this must smell amazing. Wow, they look beautiful and I bet they smell AMAZING! These would make lovely gifts for my girlfriends. Definitely going to try making them. Thanks for sharing! I love anything cinnamon. These look great! Send me some. 🙂 Or at least come share it at a linkup party at http://www.pursueyourproject.com live till Wednesday. Oh wow!!! This soap looks wonderful!!! Pinning! I ABSOLUTELY love not only your recipes that are NOT miles long of ingredients but you TELL and LIST ingredients!!!!! You are the BEST!!! I’ve spent hours watching those stupid ( my opinion) tutorials that show you pouring each spoonful and every other ingredient!!! Like I don’t get it after showing only one and obviously can figure out how many more required by the recipe!!! Thank you thank you!